CLUB Brugge and Warriors midfielder Marvelous Nakamba says their successful back-to-back encounters against DR Congo are now water under the bridge and have since shifted focus to the next game. 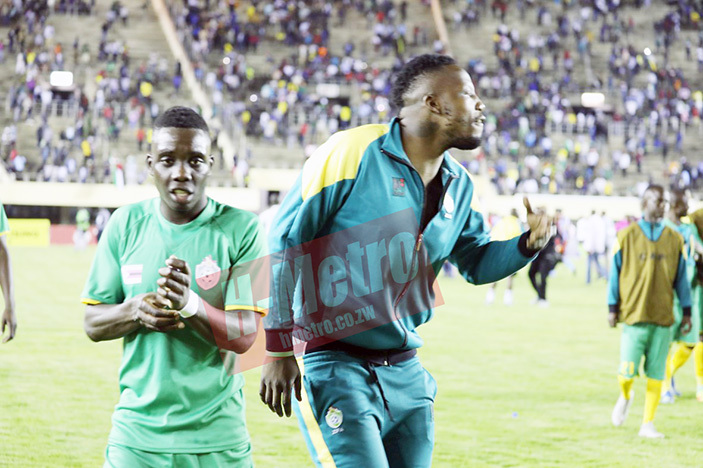 The Warriors have collected four points from the two games after a 1-1 draw at the National Sports Stadium last night which came after a 2-1 win away in Kinshasa last Saturday. “Our opinion of the game is that we wanted to win the match but then we got the points and now it is water under the bridge,” said Nakamba. Zimbabwe play Liberia away on the weekend of November 16. “We just have to focus on our match against Liberia but so far l think we are getting better as a team. “We were trying our best and I think we got an opportunity to get an early goal and then we concede. We were not under pressure, we kept on the position and we had fans rallying behind us. I think we did well as a team,” he said. Nakamba, who was in top form Tuesday night, said they need to concentrate on their remaining two games. “I think we still have two games to fight on, so with these games we still have something to play for. I think it’s still in our hands to keep on focusing and concentrating in every game as it comes. Nakamba missed the Congo Brazzaville last month due to injury featured in these two matches. “It feels good to be back and l am proud to play for our nation. “I followed even the 1-1 (draw) in Congo and l was supporting the guys,” he said. Nakamba concurred with his coach Sunday Chidzambwa that the team missed captain Knowledge Musona. “Yeah we missed him (Musona); he is a great person and good player. We missed him because he is a good inspiration in the dressing room,” he said. The Belgium-based star, who came in as a substitute during his team, Club Brugge’s 3-1 defeat to Spanish giants Atletico Madrid in the UEFA Champions League earlier this month, said collecting four points against DRC is a confidence booster. “Taking four points from DRC is motivation for us, everyone never gave us a chance so we just told ourselves that we have to prove those people wrong. I think we can do better,” he said.